For anyone who loves baking and eating delicious cookies! Many of my holiday cookie recipes require an afternoon in the kitchen, but this particular recipe gives your treat a special winter holiday flair with no extra work at all. 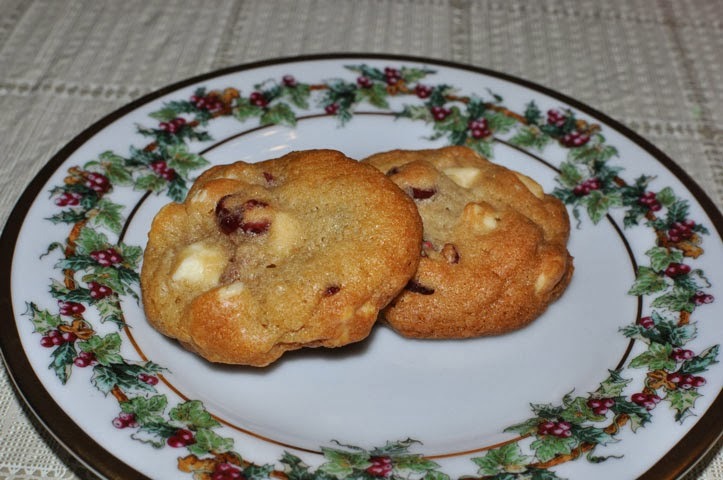 That's because it's basically a Toll House cookie recipe with white chocolate chips instead of semi-sweet and dried cranberries instead of nuts--yet these simple switches make a world of difference. Whisk flour, baking soda and salt together in a medium-sized bowl. In a large bowl with an electric mixer on medium-high speed, beat butter until creamy, about 2 minutes. Add both sugars gradually, beating until light and fluffy, about 3 minutes, and scraping down the bowl once or twice. Beat in vanilla, then eggs, one at a time, scraping down the bowl. Add about one-third of the flour mixture and mix on low speed. Gradually add the remaining flour mixture just until blended. Mix in cranberries thoroughly by hand. Next add the white chocolate chips and mix in thoroughly. Chill the dough for at least 2 hours (I usually leave it in the mixing bowl and cover with a plate but you can wrap it in wax paper and put the dough in a ziplock bag). Preheat oven to 375F. Line 2 cookie sheets with parchment paper. Use cookie scoop or measuring spoon to make 1 Tablespoon balls. Smooth balls with hands as any bits sticking out burn. Place six to a cookie sheet, and bake about 12 minutes. Light golden all over with a bit of pale in the center is perfect--some coloring on top is key, but do not let it become dark brown. --Again the quality of ingredients makes a difference, in this case the dried cranberries are the focus. Trader Joe's actually has decent dried cranberries, but if you're into mail-ordering ingredients like I obviously am, I'd recommend King Arthur Flour or Vital Choice. --I strongly recommend you try one test cookie first before doing a sheet of six to test your oven. The baking time is the tricky part of this recipe and while the cookies do soften up a little, if overbaked, they lose flavor. It's worth the time investment up front to have a batch of deliciously tender cookies.